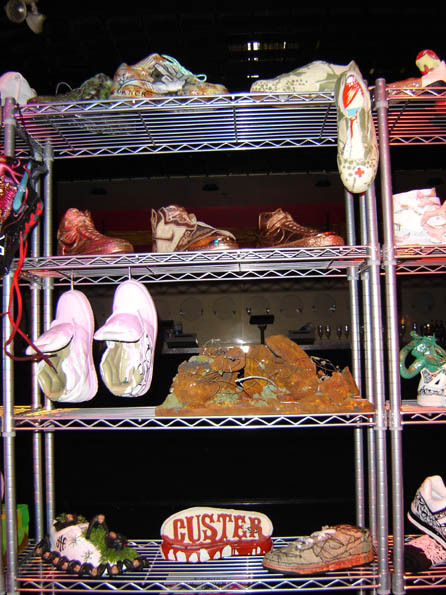 Well, the most impressive part of Sneaker Pimps Boston may have been what didn't happen--as in 500 rare and custom kicks due in by truck and not arriving in time for the show! 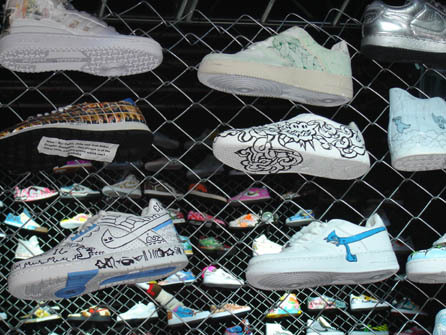 The impressive part--to me--was the reaction of Sneaker Pimps staff and volunteers: a collective, "well, whatcha gonna do? ", combined with a quick trip for drinks next door. Now that's calm, cool and collected. Even without the last truckload, the collection was huge and diverse. 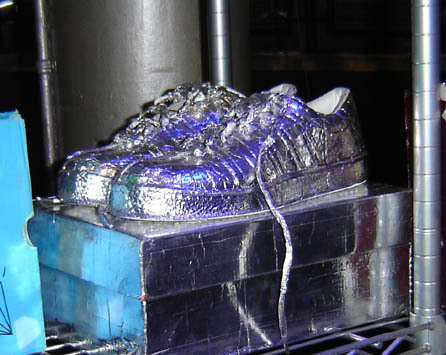 My favorites were the outrageous customs and versions of sneakers made out of all sort of materials...fuzz, fake wood paneling and aluminum foil? Hot dog! The beginning of the party itself was a bit rough, too, thanks to the Avalon crew who delayed the opening, increased the entry fee, hassled young visitors, added a dress code and basically acted like secret service stiffs guarding Bush's twin daughters. What's up with Boston? It's straight up embarrassing. 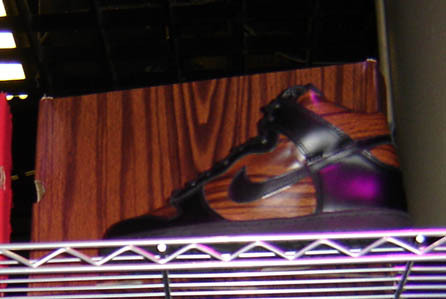 And to add to that, you'd think 500 sneaker fiends had been stuck in a truck somewhere, too, cuz the turn out didn't touch those of other Sneaker Pimp events. Damn. 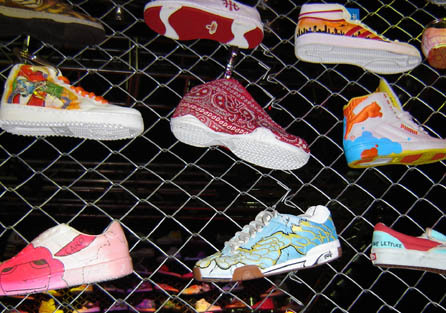 Since the same was true at the Sole Collector event, I challenge Boston heads to step up! But back to the party. 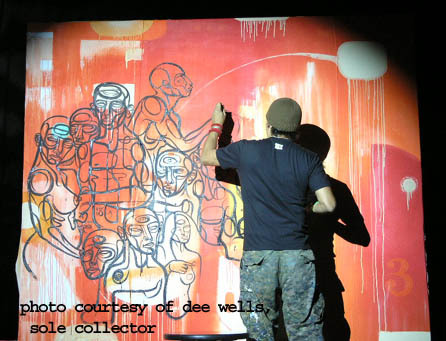 One of the highlights was artist Doze painting live at the event. That dude is NASTY, right? But back to the gig. 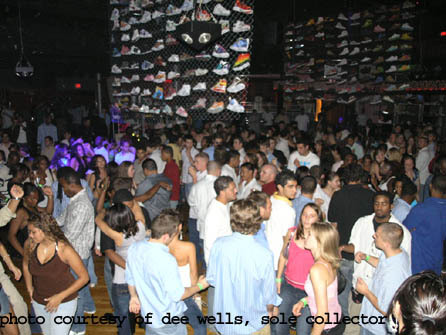 It was very different from the Sole Collector event. 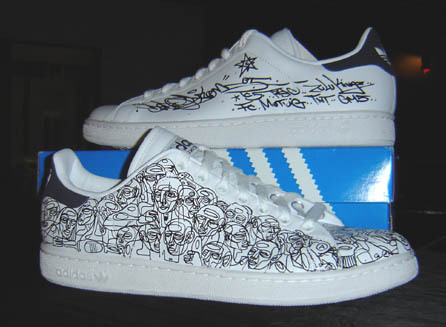 It had more the feeling of an artshow and dance party, vs. a deep sneaker-head competition. 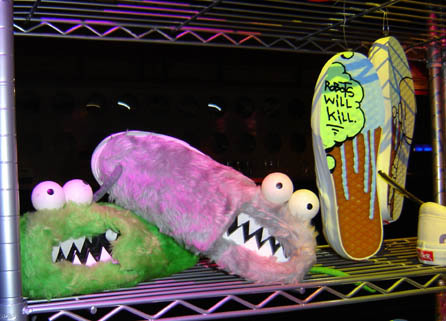 In this case, by the time the partying got going, it felt like a hopping party, with kicks invited. 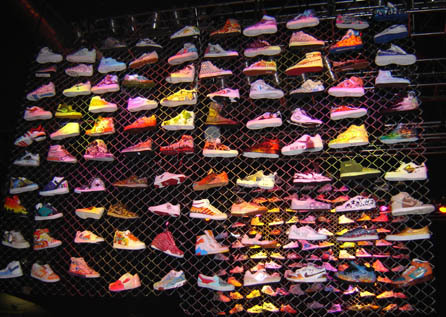 In the end, there were more women, but fewer sneaker maniacs. Go figure. In any case, I loved both events, and I just hope Boston repped well enough to have them back! 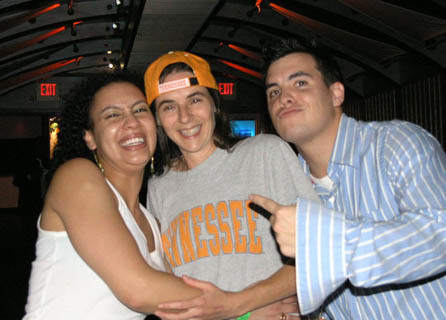 Me, Rob Heppler from weeklydrop.com and an FSF friend.